People with a passion for food love expressing themselves through their cooking. Whether it’s marinades, seasoning mixes, or spice blends, Lawry’s products are a great way to express yourself in the kitchen by adding flavor to your favorite foods. Your passion for savory flavors shows you have an enthusiasm for politics, enjoy camping and hiking and love outdoor barbecues and American cuisine. Along with the other Conventionalists, you tend to be more introverted than the rest of the groups and often describe yourself as a homebody. Asian Style Beef & Broccoli – This easy to prepare stir fry meal will remind your family of their favorite Asian restaurant. The dish combines beef, broccoli and seasonings with a hint of garlic. Serve it over rice and you have a complete, satisfying meal. Chimichurri Burrito Casserole – Lawry’s gives the familiar Burrito casserole a new twist with this traditional Latin American sauce. With a few simple fresh ingredients, mealtime just got a lot more exciting. Mediterranean Sundried Tomato & Garlic Chicken – Add a taste of the Mediterranean to your family’s casserole. This easy to bake casserole combines chicken, pasta, tomatoes and Feta cheese to easily make a flavorful meal any night of the week. Tuscan Style Chicken Marsala with Garlic and Basil – Chicken Marsala is a restaurant favorite, but it might not make the menu at home. This effortless version comes together on your stovetop with just a few fresh ingredients. Flavorful garlic and basil gives this meal its own Tuscan flair, perfect for serving over pasta or rice. I like all the flavors above. That must mean I'm a Joyous Joining, Self-Assured Adventuring, lovin The Sweet Life, Conventionalists. Or maybe it just means I love flavorful food! And with Lawry's, flavorful food has never been easier with so many choices! We marinated a pork loin with the Tuscan Sun-Dried Tomato, and it turned out really well. The whole family loved it. We also did the Asian Style Beef & Broccoli. That was super yum! I can't wait to try all the flavor choices from Lawry's new selection. 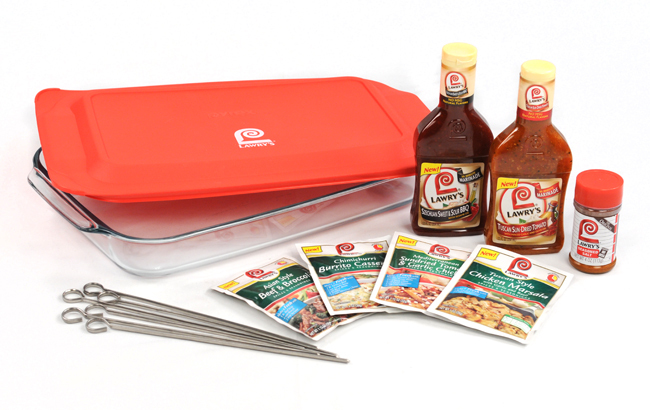 One lucky winner will receive this great prize pack which includes : a pyrex marinating dish, a set of skewers, Lawry’s two new marinades, as well as a sample of each of the four new Seasoning Mixes and a bottle of Lawry’s Seasoned Salt . *Follow me @jamaise at Twitter & Tweet this : RT @jamaise #GIVEAWAY #WIN - Lawry's Prize Pack~ pyrex dish,skewers,2 marinades,4 Seasoning Mix http://bit.ly/96Yywd #myblogspark ends10/27 tweet each day for one entry each ! Disclaimer: Lawry's provided me with all information and product to review through My Blog Spark. I was under no obligation to review it if I so chose. Nor was I under any obligation to write a positive review or sponsor a product giveaway in return for the free product. These views are my own. Well.... I guess I'm a savory conventionalist! I am a spicy flavor. I am a gfc follower. I like spicey so guess the sundried tomato would be one I would like. Hope I get to try them! I'd like to try the Tuscan Sun-Dried Tomato. I usually like savory and salty flavors! I entered the Havaianas giveaway. I am a GFC follower and I am a sweet lifer!! GFC follower! I love spicy food! I would like sweet...and I am a friend! I am a Sweet Lifer...I like sweet flavors. My favorite flavor is "sweet!" Thanks for the giveaway! 1 I entered Havainas Giveaway. 2. I entered Havainas Giveaway. 3. I entered Havainas Giveaway. 1. I entered Yoplait giveaway. 2. I entered Yoplait giveaway. 3. I entered Yoplait giveaway. I'm spicy - love my jalapenos! I like them all but leans toward salty!